A season of sitting at the feet of Jesus looks different than our twenty minutes a day with Jesus. God doesn’t want an obliged heart—He wants a willing heart. The forty-six days leading up to Easter give us the opportunity to take the time to slow down and remember who Jesus is, what He did for us, and what He is continuing to do. Without Easter, we wouldn’t have eternal life. We get caught up in the “necessary.” If it’s Christmas, it is necessary to decorate, shop for presents, bake, entertain houseguests and the like. If it is Easter, it is necessary to decorate again and host family and friends for dinner on Easter Sunday. We get really good at being busy all in the name of Jesus, right? For Christians, we do all of these things while proclaiming “Jesus is the reason for the season.” We do, and do, and do. Sometimes we get the opportunity to share the love of Jesus and the Gospel during our hectic holiday seasons, but if we are honest, is that truly the emphasis of your holiday season? How about your everyday? If someone asked you who Jesus is to you, would you be able to respond to them personally? I’m not talking about Evangelism Explosion or Three Circle kind of answers. I’m talking about who is Jesus to you personally? For a lot of you, you accepted Jesus as your Lord and Savior many, many years ago. You’ve been doing a great job of staying on the path God laid out before you. You’ve been obedient. You’ve attended church, raised your children in church, you’ve served, delivered meals, and shared your faith. Those are all great things. However, we get in the habit of using our works to show our love and devotion to Jesus instead of spending time with Jesus. My love language is acts of service. I’m not big on getting gifts, but if my husband does an act of service for me like doing the laundry, making dinner, doing the dishes, getting my car serviced…that’s how I receive love. Jesus’ love language is quality time. Jesus wants you and me to spend time with Him. He’s our Teacher. We can’t learn if we aren’t willing to sit with Him and listen. 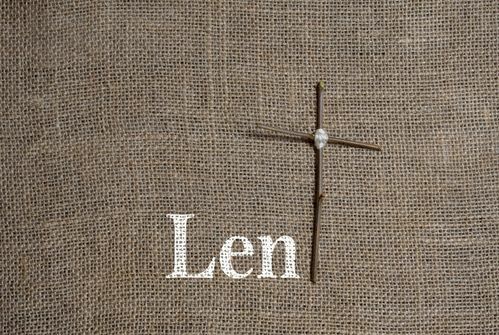 The solemn season of Lent is the perfect time to reflect, slow down, and spend intentional time with Jesus. We learn so much about God through the person of Jesus. We learn about our future and our potential through His life. We can’t be like Jesus if we don’t know Jesus. In the Luke 10 passage, Mary’s posture demonstrated her readiness to believe what Jesus taught. This implied faith as well as submission. To be a disciple of Jesus, we must assume the position of a student. He is the Teacher. In glancing at the passage, it appeared Martha was the only one serving. She was preparing the meal that would be served to Jesus and the disciples. However, Mary was also serving Jesus. She was ministering to Jesus. There is nothing like an attentive student listening to a teacher. Mary was also waiting on Jesus. If Jesus had told her to do something, she would have. She might not have physically been sitting at His feet any longer after that point, but her heart would remain in that posture. She was waiting to hear from Jesus as to what He wanted her to do. QUESTION: When was the last time you sat with a postured heart waiting to hear what the Lord would have you do? Sitting at Jesus’ feet also implies a great love for Jesus. Mary was eager to learn from Jesus, and Jesus was eager for her to learn. “But one thing is necessary” (Luke 10:42). Jesus spoke a “but” to Martha. Martha was a little snippy with Jesus, but Jesus gave her words to consider. He told Martha she was busy doing many things, but Mary was choosing the most important thing, and that thing would never be taken away from her. Perhaps Martha was snippy with Jesus because she didn’t know Jesus as well as her sister because she didn’t take the time to get to know Him. She wasn’t willing to risk to be at her Savior’s feet (women weren’t allowed to learn in the same way men were at this time). Jesus must be our only priority. We must all commit to sitting at His feet. If we compare Martha and Mary, the biggest difference I see is that Martha believed in Jesus—she was a saved saint destined for heaven, but we never see her at Jesus’ feet. Her response to Jesus on three separate occasions illustrates her relationship with Him. He was at arm’s distance, not because He kept the distance, but because she kept Him there. However, we see Mary on three separate occasions at the feet of Jesus. We see her in this passage in Luke 10:38-42 at His feet, she threw herself at Jesus’ feet when He came back after Lazarus’ death (John 11:32), and we see her at Jesus’ feet when she anoints His feet with oil right before His death (John 12:3). Both of these ladies would end up in heaven because of their belief in Jesus, but how differently they lived their lives on this earth. Mary soaked in every minute of Jesus when He was around, and Martha focused on the worldly things without fully realizing how little time she had with her Savior. Mary knew and desired Jesus in a different way because she spent more time with Him. Who would you say you are more like? The privilege of position is no substitute for faith and obedience. As Christians, we all have the opportunity to come into the presence of God. However, we shouldn’t take this privilege for granted. We don’t earn a place at His feet. It’s His gift to us. If we desire the company of men (spouses, friends, and the like), how much more should we desire the company of Jesus? Forty-six days at the feet of Jesus will change you. You become like who you spend time with. Don’t spend time with Jesus because someone tells you to. Do it because you want to. There’s no better time to sit at His feet and revisit His ministry than the reverent season of Lent. It’s a time to reflect on all He did for you and me on that Good Friday. I think we can all agree we need revival. There’s no better time than NOW. Start today. Still looking for a Lent devotional? 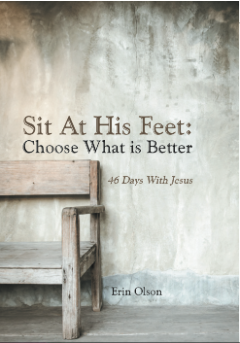 There's still time to get a copy of Sit At His Feet: Choose What is Better. The devotional is available in paperback and electronic delivery (via Kindle, Nook, and iBooks). For ordering information, please visit sandalfeet.org/sitathisfeet.